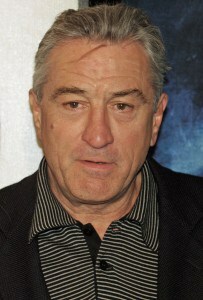 Robert De Niro (born August 17, 1943) is an American actor, director, producer, and voice actor. His first major film roles were in Bang the Drum Slowly and Mean Streets, both in 1973. Then in 1974, after not receiving the role of Michael Corleone in The Godfather, he was cast as the young Vito Corleone in The Godfather Part II, a role for which he won the Academy Award for Best Supporting Actor. His longtime collaboration with director Martin Scorsese began with Mean Streets, and later earned De Niro an Academy Award for Best Actor for his portrayal of Jake LaMotta in the 1980 film Raging Bull. He earned nominations for Taxi Driver in 1976 and Cape Fear in 1991. De Niro received additional Academy Award nominations for Michael Cimino’s The Deer Hunter (1978), Penny Marshall’s Awakenings (1990), and David O. Russell’s Silver Linings Playbook (2012). His portrayal of gangster Jimmy Conway in Scorsese’s Goodfellas earned him a BAFTA nomination in 1990. De Niro has earned four nominations for the Golden Globe Award for Best Actor – Motion Picture Musical or Comedy, for his work in New York, New York (1977), Midnight Run (1988), Analyze This (1999), and Meet the Parents (2000). He has also simultaneously directed and starred in films such as 1993’s A Bronx Tale and 2006’s The Good Shepherd. De Niro has received accolades for his career, including the AFI Life Achievement Award (2003) and the Golden Globe Cecil B. DeMille Award (2010). Silver Linings Playbook Pat Solitano, Sr.
Daniel Wymbs: I love Raging Bull. Love everything he ever did, a total genius. Flo McSweeney (actress): will pick the actors I like / admire. William Dafoe … De Niro… Pacino…. Denzel.